We've put together resources for those who are leading Celebrate Recovery groups. 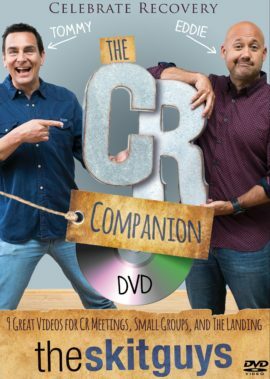 Use these DVDs and individual downloadable videos to help bring laughter to your group and break down walls for truth to enter in. Hurts, hang-ups, and habits. We all have them, but do we know how to let them go? The Skit Guys take you down a hilarious road with the 3 H’s, allowing CR groups and congregations to look at their own lives and come to grips with the things they need to let go and let God heal. This video also includes a personal testimony from Eddie James about understanding the hurts he carried in his life. 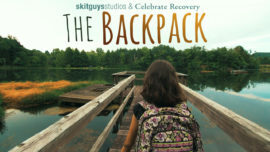 The Skit Guys are here with tools to help you put together a dynamic Celebrate Recovery meeting! 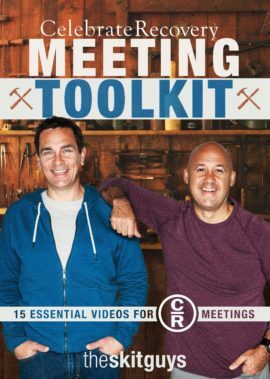 In this DVD you'll find short videos for every aspect of your CR meeting. Tommy and Eddie provide you with pieces and parts that explain and help transition into different elements of your meeting. This is a lighthearted skit- a radio call in show, featuring Tommy's many (and sometimes strange) personalities, about using God's phone number, Jeremiah 33:3, when we're hurting. If nothing else- Eddie cannot seem to keep a straight face! We've all got ghosts from our past. Whether they're self-inflicted wounds or pain imposed by others, we've all been there. 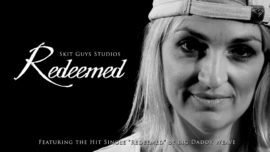 Watch and listen as the Cross of Christ frees us to sing along with Big Daddy Weave that "I am Redeemed." Every last one of us needs God. This video reminds us that every hour of every day, we need God. We need his help, forgiveness and love. Watch as a variety of people wrestle with their needs and desires and ultimately rest in their need of God. Features the Matt Maher song, "Lord, I Need You" performed by Marcy Priest. At Celebrate Recovery, you don't need a disguise. You don't need a wig or a new coat of paint. You just need to come as you are. Watch as Tommy and Eddie perform a sketch talking about this very idea. 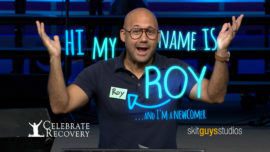 Roy may only be a NEWCOMER at his Celebrate Recovery group, but he has already picked up on all their lingo. Watch as Roy gives his two cents on what Celebrate Recovery could do better, and listen as he describes his thankfulness for the group. Where's the best place to be any night of the week? Celebrate Recovery! Watch as Tommy tries to tell Eddie what the steps are...and fails miserably. Don't worry, Eddie sets him straight in this funny introduction to some CR steps. 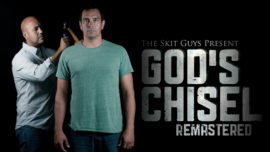 Great way to break the ice and start your CR groups with The Skit Guys! In this skit, packed with humor and depth, The Skit Guys dig into what the Serenity Prayer is all about. As one man prays the prayer, God challenges him to understand what the words actually mean, and to actually mean the words he says. We all know what it's like to carry around life's burdens, how they weigh us down and keep us from enjoying life. This video reminds us the power of recovery and relationships, and how God can use Celebrate Recovery to lead us to healing. 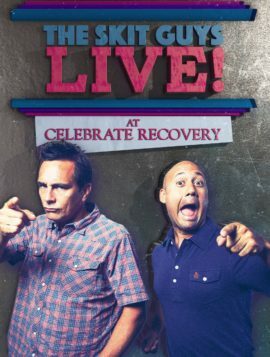 When Tommy and Eddie performed for the thousands of leaders at Celebrate Recovery, they prayed God would use them to bring laughter and truth to edify His people. And that's our prayer for you too. In this skit, packed with humor and depth, The Skit Guys dig into what the Serenity Prayer is all about. 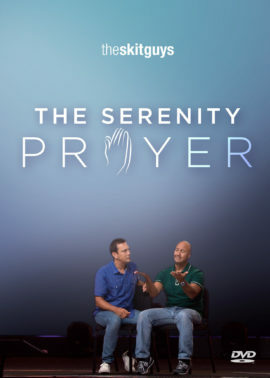 The DVD includes the Serenity Prayer mini-movie, a devotional with Tommy and Eddie, plus bonus features like the script, small group questions, devotional slides, and more. 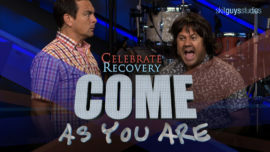 Audiences at Celebrate Recovery events have laughed and cried with The Skit Guys. 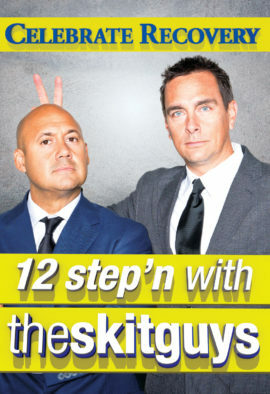 You'll be thrilled to know that this compilation DVD is filled with those skits and more. Now you can bring these skits with you to laugh and cry in the privacy of your own home (or use them to make other people laugh or cry at your CR meetings!). This DVD includes 9 great videos for CR meetings, small groups, and The Landing. When God chisels the dead weight out of our lives it can be quite painful. Tommy and Eddie give a very creative look at a typical Christian having to go through the process of discipline. The writer of Ephesians says “For we are God's workmanship” (Eph. 2:10). Elsewhere we’re described as a “poem.” God views us as being his original masterpiece. The purchase of this video includes media slides and study guide.